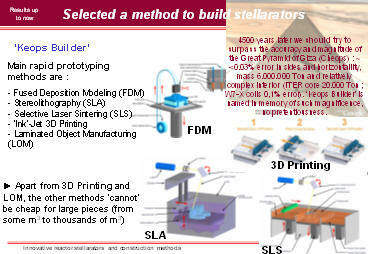 On 3rd April 2009 the seminar 'Innovative reactor stellarators and construction methods' was given by Vicente M. Queral in the NFL 'National Fusion Laboratory', CIEMAT ('Centro de Investigaciones Energéticas, Medioambientales y Tecnológicas') in Madrid, Spain. NFL houses the TJ-II heliac stellarator facility. 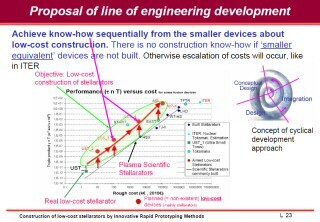 The studies for the presentation were carried out almost exclusively during my spare time (nights and weekends) as I was working in Remote Handling for ITER, IFMIF and DEMO. Consequently the accuracy and detail of the presented results is low. 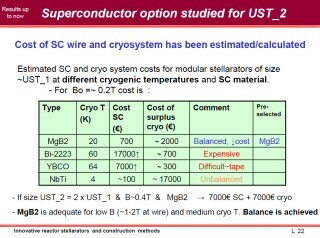 Estimations about the feasibility of using superconducting coils is shown in the presentation. Also many other concepts. A video of the Seminar given is available, but not online. 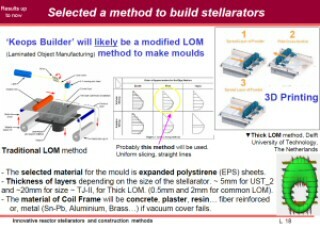 On 15st November 2010 the seminar 'Construction of low-cost stellarators by Innovative Rapid Prototyping Methods. 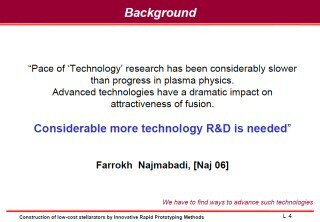 Discussion of possible benefits for experimental and theoretical fusion' was given by Vicente M. Queral in the NFL 'National Fusion Laboratory', CIEMAT. This seminar was given for the physicist's group in LNF. UST_1 shown that technological innovation is possible. 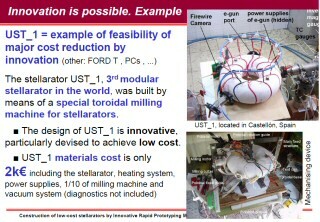 The cost of the UST_1 core (the stellarator itself) was only 150€!!. What could be possible with the use of 3D printers or even more advanced methods?